Provide the PIP with information on the report that POW David Hrdlicka was under the control of Col Chaeng, commander of the Laos 11th Regiment, Kham Keut, Kham Moname Province, in 1989. ໃຫ້ຂໍ້ມູນໃນລາຍງານວ່າ ນັກໂທດຊະເລີຍເສິກ David Hrdlicka ຍູ່ພາຍໃຕ້ການຄວບຄຸມຂອງ Col Chaeng, ຜູ້ບັງຄັບບັນຊາ ກອງທະຫານທີ່ 11 ຂອງລາວ, ເມືອງຄຳເກີດ, ຈັງຫວັດບໍລິຄຳໄຊ ໃນປີ 1989. 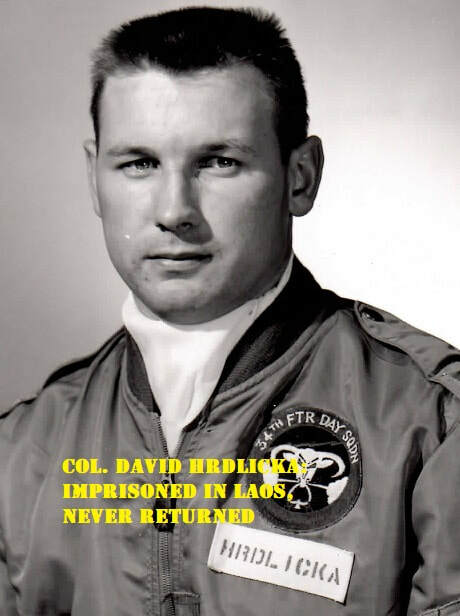 According to a U.S. government report, an American federal agent received information that David Hrdlicka, known captured but never returned at the end of the Vietnam War, was suspected to be under the control of Col Chaeng, commander of the Laos 11th Regiment, in Kham Keut, Kham Moname Province, in 1989. This report may be associated with a French national named Pierre O’Reilly, last believed to be living in California. The family of Col. Hrdlicka has received several reports concerning his alleged survival after Operation Homecoming and would like further information and the chance to communicate with those who provided this information. ຕາມລາຍງານຂອງລັດຖະບານສະຫະລັດອາເມລິກາ, ຕົວແທນລັດຖາບານກາງອາເມລິກາໄດ້ຮັບຂໍ້ມູນວ່າ David Hrdlicka, ທີ່ຖືກຈັບ ແຕ່ຍັງບໍ່ໄດ້ຖືກສົ່ງຕົວກັບຄືນ ຫຼັງສຶ້ນສຸດສົງຄາມຫວຽດນາມ, ຍັງຄົງຖືກສົງໃສວ່າຈະຢູ່ພາຍໃຕ້ການຄວບຄຸມຂອງ Col Chaeng, ຜູ້ບັງຄັບບັນຊາ ກອງທະຫານທີ່ 11 ຂອງລາວ ໃນເມືອງຄຳເກີດ, ຈັງຫວັດບໍລິຄຳໄຊ ໃນປີ 1989. ການລາຍງານນີ້ອາດກ່ຽວຂ້ອງກັບຊາວຝຣັ່ງເສດ ທີ່ຊື່ວ່າ Pierre O’Reilly, ຊຶ່ງລ່າສຸດ ເຊື່ອວ່າເຂົາອາໄສຢູ່ໃນລັດຄາລີຟໍເນຍ. ຄອບຄົວຂອງ Col. Hrdlicka ໄດ້ຮັບລາຍງານຫຼາຍກ່ຽວກັບເຂົາ ວ່າຍັງມີໍີວິດຍູ່ ຫຼັງປະຕິບັດການການກັບຄືນສຸ່ບ້ານ ແລະ ຕ້ອງການຂໍ້ມູນເພີ່ມເຕີ່ ແລະ ໂອກາດສື່ສານກັບຜູ້ທີ່ໃຫ້ຂໍ່ມູນເຫຼົ່ານີ້.